This chapter contains descriptions for 16 of the attributes that human beings display when they behave intelligently. 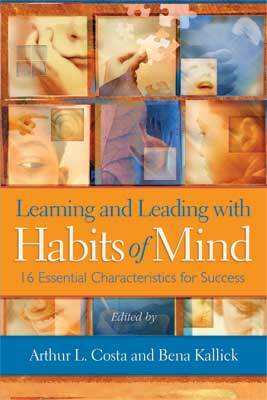 In this book, we refer to them as Habits of Mind. They are the characteristics of what intelligent people do when they are confronted with problems, the resolutions to which are not immediately apparent. These Habits of Mind seldom are performed in isolation; rather, clusters of behaviors are drawn forth and used in various situations. For example, when listening intently, we use the habits of thinking flexibly, thinking about our thinking (metacognition), thinking and communicating with clarity and precision, and perhaps even questioning and posing problems. Do not conclude, based on this list, that humans display intelligent behavior in only 16 ways. The list of the Habits of Mind is not complete. We want this list to initiate a collection of additional attributes. In fact, 12 attributes of "Intelligent Behavior" were first described in 1991 (Costa, 1991). Since then, through collaboration and interaction with many others, the list has been expanded. You, your colleagues, and your students will want to continue the search for additional Habits of Mind to add to this list of 16. Educational outcomes in traditional settings focus on how many answers a student knows. When we teach for the Habits of Mind, we are interested also in how students behave when they don't know an answer. The Habits of Mind are performed in response to questions and problems, the answers to which are not immediately known. We are interested in enhancing the ways students produce knowledge rather than how they merely reproduce it. We want students to learn how to develop a critical stance with their work: inquiring, editing, thinking flexibly, and learning from another person's perspective. The critical attribute of intelligent human beings is not only having information but also knowing how to act on it. What behaviors indicate an efficient, effective thinker? What do human beings do when they behave intelligently? Vast research on effective thinking, successful people, and intelligent behavior by Ames (1997), Carnegie and Stynes (2006), Ennis (1991), Feuerstein, Rand, Hoffman, and Miller (1980), Freeley (as reported in Strugatch, 2004), Glatthorn and Baron (1991), Goleman (1995), Perkins (1991), Sternberg (1984), and Waugh (2005) suggests that effective thinkers and peak performers have identifiable characteristics. These characteristics have been identified in successful people in all walks of life: lawyers, mechanics, teachers, entrepreneurs, salespeople, physicians, athletes, entertainers, leaders, parents, scientists, artists, teachers, and mathematicians. Horace Mann, a U.S. educator (1796–1859), once observed that "habit is a cable; we weave a thread of it each day, and at last we cannot break it." In Learning and Leading with Habits of Mind, we focus on 16 Habits of Mind that teachers and parents can teach, cultivate, observe, and assess. The intent is to help students get into the habit of behaving intelligently. A Habit of Mind is a pattern of intellectual behaviors that leads to productive actions. When we experience dichotomies, are confused by dilemmas, or come face-to-face with uncertainties, our most effective response requires drawing forth certain patterns of intellectual behavior. When we draw upon these intellectual resources, the results are more powerful, of higher quality, and of greater significance than if we fail to employ such patterns of intellectual behavior. A Habit of Mind is a composite of many skills, attitudes, cues, past experiences, and proclivities. It means that we value one pattern of intellectual behaviors over another; therefore, it implies making choices about which patterns we should use at a certain time. It includes sensitivity to the contextual cues that signal that a particular circumstance is a time when applying a certain pattern would be useful and appropriate. It requires a level of skillfulness to use, carry out, and sustain the behaviors effectively. It suggests that after each experience in which these behaviors are used, the effects of their use are reflected upon, evaluated, modified, and carried forth to future applications. Figure 2.1 summarizes some of these dimensions of the Habits of Mind, which are elaborated in Chapter 3. The following sections describe each of the 16 Habits of Mind. Value: Choosing to employ a pattern of intellectual behaviors rather than other, less productive patterns. Inclination: Feeling the tendency to employ a pattern of intellectual behaviors. Sensitivity: Perceiving opportunities for, and appropriateness of, employing the pattern of behaviors. Capability: Possessing the basic skills and capacities to carry through with the behaviors. Commitment: Constantly striving to reflect on and improve performance of the pattern of intellectual behaviors. Policy: Making it a policy to promote and incorporate the patterns of intellectual behaviors into actions, decisions, and resolutions of problematic situations. Success seems to be connected with action. Successful people keep moving. They make mistakes, but they never quit. Efficacious people stick to a task until it is completed. They don't give up easily. They are able to analyze a problem, and they develop a system, structure, or strategy to attack it. They have a repertoire of alternative strategies for problem solving, and they employ a whole range of these strategies. They collect evidence to indicate their problem-solving strategy is working, and if one strategy doesn't work, they know how to back up and try another. They recognize when a theory or an idea must be rejected and another employed. They have systematic methods for analyzing a problem, which include knowing how to begin, what steps must be performed, what data must be generated or collected, and what resources are available to assist. Because they are able to sustain a problem-solving process over time, they are comfortable with ambiguous situations. Students often give up when they don't immediately know the answer to a problem. They sometimes crumple their papers and throw them away, exclaiming "I can't do this!" or "It's too hard!" Sometimes they write down any answer to get the task over with as quickly as possible. Some of these students have attention deficits. They have difficulty staying focused for any length of time; they are easily distracted, or they lack the ability to analyze a problem and develop a system, structure, or strategy of attack. They may give up because they have a limited repertoire of problem-solving strategies, and thus they have few alternatives if their first strategy doesn't work. Goal-directed, self-imposed delay of gratification is perhaps the essence of emotional self-regulation: the ability to deny impulse in the service of a goal, whether it be building a business, solving an algebraic equation, or pursuing the Stanley Cup. Effective problem solvers are deliberate: they think before they act. They intentionally establish a vision of a product, an action plan, a goal, or a destination before they begin. They strive to clarify and understand directions, they develop a strategy for approaching a problem, and they withhold immediate value judgments about an idea before they fully understand it. Reflective individuals consider alternatives and consequences of several possible directions before they take action. They decrease their need for trial and error by gathering information, taking time to reflect on an answer before giving it, making sure they understand directions, and listening to alternative points of view. Listening is the beginning of understanding. … Wisdom is the reward for a lifetime of listening. Let the wise listen and add to their learning and let the discerning get guidance. People who demonstrate this Habit of Mind are able to see through the diverse perspectives of others. They gently attend to another person, demonstrating their understanding of and empathy for an idea or a feeling by paraphrasing it accurately, building upon it, clarifying it, or giving an example of it. Senge, Roberts, Ross, Smith, and Kleiner (1994) suggest that to listen fully means to pay close attention to what is being said beneath the words—listening not only to the "music" but also to the essence of the person speaking; not only for what someone knows but also for what that person is trying to represent. Ears operate at the speed of sound, which is far slower than the speed of light the eyes take in. Generative listening is the art of developing deeper silences in oneself, slowing the mind's hearing to the ears' natural speed and hearing beneath the words to their meaning. We spend 55 percent of our lives listening, but it is one of the least taught skills in schools. We often say we are listening, but actually we are rehearsing in our head what we are going to say when our partner is finished. Some students ridicule, laugh at, or put down other students' ideas. They interrupt, are unable to build upon, can't consider the merits of, or don't operate on another person's ideas. We want students to learn to devote their mental energies to another person and to invest themselves in their partner's ideas. We want students to learn to hold in abeyance their own values, judgments, opinions, and prejudices so they can listen to and entertain another person's thoughts. This is a complex skill requiring the ability to monitor one's own thoughts while at the same time attending to a partner's words. Listening in this way does not mean we can't disagree with someone. Good listeners try to understand what other people are saying. In the end, they may disagree sharply, but because they have truly listened, they know exactly the nature of the disagreement. Of all forms of mental activity, the most difficult to induce even in the minds of the young, who may be presumed not to have lost their flexibility, is the art of handling the same bundle of data as before, but placing them in a new system of relations with one another by giving them a different framework, all of which virtually means putting on a different kind of thinking-cap for the moment. It is easy to teach anybody a new fact. … but it needs light from heaven above to enable a teacher to break the old framework in which the student is accustomed to seeing. An amazing discovery about the human brain is its plasticity—its ability to "rewire," change, and even repair itself to become smarter. Flexible people have the most control. They have the capacity to change their minds as they receive additional data. They engage in multiple and simultaneous outcomes and activities, and they draw upon a repertoire of problem-solving strategies. They also practice style flexibility, knowing when thinking broadly and globally is appropriate and when a situation requires detailed precision. They create and seek novel approaches, and they have a well-developed sense of humor. They envision a range of consequences. Flexible people can address a problem from a new angle using a novel approach, which de Bono (1991) refers to as "lateral thinking." They consider alternative points of view or deal with several sources of information simultaneously. Their minds are open to change based on additional information, new data, or even reasoning that contradicts their beliefs. Flexible people know that they have and can develop options and alternatives. They understand means-ends relationships. They can work within rules, criteria, and regulations, and they can predict the consequences of flouting them. They understand immediate reactions, but they also are able to perceive the bigger purposes that such constraints serve. Thus, flexibility of mind is essential for working with social diversity, enabling an individual to recognize the wholeness and distinctness of other people's ways of experiencing and making meaning. Flexible thinkers are able to shift through multiple perceptual positions at will. One perceptual orientation is what Jean Piaget called egocentrism, or perceiving from our own point of view. By contrast, allocentrism is the position in which we perceive through another person's orientation. We operate from this second position when we empathize with another's feelings, predict how others are thinking, and anticipate potential misunderstandings. Another perceptual position is macrocentric. It is similar to looking down from a balcony to observe ourselves and our interactions with others. This bird's-eye view is useful for discerning themes and patterns from assortments of information. It is intuitive, holistic, and conceptual. Because we often need to solve problems with incomplete information, we need the capacity to perceive general patterns and jump across gaps of incomplete knowledge. Yet another perceptual orientation is microcentric, examining the individual and sometimes minute parts that make up the whole. This worm's eye view involves logical, analytical computation, searching for causality in methodical steps. It requires attention to detail, precision, and orderly progressions. Flexible thinkers display confidence in their intuition. They tolerate confusion and ambiguity up to a point, and they are willing to let go of a problem, trusting their subconscious to continue creative and productive work on it. Flexibility is the cradle of humor, creativity, and repertoire. Although many perceptual positions are possible—past, present, future, egocentric, allocentric, macrocentric, microcentric, visual, auditory, kinesthetic—the flexible mind knows when to shift between and among these positions. Some students have difficulty considering alternative points of view or dealing with more than one classification system simultaneously. Their way to solve a problem seems to be the only way. They perceive situations from an egocentric point of view: "My way or the highway!" Their minds are made up: "Don't confuse me with facts. That's it!" The human species is known as Homo sapiens sapiens, which basically means "a being that knows their knowing" (or maybe it's "knows they're knowing"). What distinguishes humans from other forms of life is our capacity for metacognition—the ability to stand off and examine our own thoughts while we engage in them. Occurring in the neocortex, metacognition, or thinking about thinking, is our ability to know what we know and what we don't know. It is our ability to plan a strategy for producing the information that is needed, to be conscious of our own steps and strategies during the act of problem solving, and to reflect on and evaluate the productiveness of our own thinking. Although inner language, thought to be a prerequisite for metacognition, begins in most children around age 5, metacognition is a key attribute of formal thought flowering at about age 11. The major components of metacognition are, when confronted with a problem to solve, developing a plan of action, maintaining that plan in mind over a period of time, and then reflecting on and evaluating the plan upon its completion. Planning a strategy before embarking on a course of action helps us keep track of the steps in the sequence of planned behavior at the conscious awareness level for the duration of the activity. It facilitates making temporal and comparative judgments; assessing the readiness for more or different activities; and monitoring our interpretations, perceptions, decisions, and behaviors. An example would be what superior teachers do daily: developing a teaching strategy for a lesson, keeping that strategy in mind throughout the instruction, and then reflecting upon the strategy to evaluate its effectiveness in producing the desired student outcomes. Intelligent people plan for, reflect on, and evaluate the quality of their own thinking skills and strategies. Metacognition means becoming increasingly aware of one's actions and the effect of those actions on others and on the environment; forming internal questions in the search for information and meaning; developing mental maps or plans of action; mentally rehearsing before a performance; monitoring plans as they are employed (being conscious of the need for midcourse correction if the plan is not meeting expectations); reflecting on the completed plan for self-evaluation; and editing mental pictures for improved performance. Interestingly, not all humans achieve the level of formal operations. As Russian psychologist Alexander Luria found, not all adults metacogitate. Although the human brain is capable of generating this reflective consciousness, generally we are not all that aware of how we are thinking, and not everyone uses the capacity for consciousness equally (Chiabetta, 1976; Csikszentmihalyi, 1993; Whimbey, Whimbey, & Shaw, 1975; Whimbey, 1980). The most likely reason is that all of us do not take the time to reflect on our experiences. Students often do not take the time to wonder why they are doing what they are doing. They seldom question themselves about their own learning strategies or evaluate the efficiency of their own performance. Some children virtually have no idea of what they should do when they confront a problem, and often they are unable to explain their decision-making strategies (Sternberg & Wagner, 1982). When teachers ask, "How did you solve that problem? What strategies did you have in mind?" or "Tell us what went on in your head to come up with that conclusion," students often respond, "I don't know. I just did it." We want students to perform well on complex cognitive tasks. A simple example might be drawn from a reading task. While reading a passage, we sometimes find that our minds wander from the pages. We see the words, but no meaning is being produced. Suddenly, we realize that we are not concentrating and that we've lost contact with the meaning of the text. We recover by returning to the passage to find our place, matching it with the last thought we can remember, and once having found it, reading on with connectedness. This inner awareness and the strategy of recovery are components of metacognition. Whether we are looking at the stamina, grace, and elegance of a ballerina or a carpenter, we see a desire for craftsmanship, mastery, flawlessness, and economy of energy to produce exceptional results. People who value truthfulness, accuracy, precision, and craftsmanship take time to check over their products. They review the rules by which they are to abide, they review the models and visions they are to follow, and they review the criteria they are to use to confirm that their finished product matches the criteria exactly. To be craftsmanlike means knowing that one can continually perfect one's craft by working to attain the highest possible standards and by pursuing ongoing learning to bring a laserlike focus of energies to accomplishing a task. These people take pride in their work, and they desire accuracy as they take time to check over their work. Craftsmanship includes exactness, precision, accuracy, correctness, faithfulness, and fidelity. For some people, craftsmanship requires continuous reworking. Mario Cuomo, a great speechwriter and politician, once said that his speeches were never done; it was only a deadline that made him stop working on them. Some students may turn in sloppy, incomplete, or uncorrected work. They are more eager to get rid of the assignment than to check it over for accuracy and precision. They are willing to settle for minimum effort rather than invest their maximum. They may be more interested in expedience rather than excellence. The formulation of a problem is often more essential than its solution, which may be merely a matter of mathematical or experimental skill. … To raise new questions, new possibilities, to regard old problems from a new angle, requires creative imagination and marks real advances. How reliable is this data source? From whose viewpoint are we seeing, reading, or hearing? From what angle, what perspective, are we viewing this situation? How are these (people, events, or situations) related to each other? What do you think would happen if … ? If that is true, then what might happen if … ? Why does the hair on my head grow so fast, while the hair on my arms and legs grows so slowly? What would happen if we put the saltwater fish in a freshwater aquarium? What are some alternative solutions to international conflicts, other than wars? Some students may be unaware of the functions, classes, syntax, or intentions in questions. They may not realize that questions vary in complexity, structure, and purpose. They may pose simple questions intending to derive maximal results. When confronted with a discrepancy, they may lack an overall strategy to search for and find a solution. I've never made a mistake. I've only learned from experience. Intelligent humans learn from experience. When confronted with a new and perplexing problem, they will draw forth experiences from their past. They often can be heard to say, "This reminds me of …" or "This is just like the time when I …" They explain what they are doing now with analogies about or references to their experiences. They call upon their store of knowledge and experience as sources of data to support, theories to explain, or processes to solve each new challenge. They are able to abstract meaning from one experience, carry it forth, and apply it in a novel situation. Too often, students begin each new task as if it were being approached for the first time. Teachers are dismayed when they invite students to recall how they solved a similar problem previously—and students don't remember. It's as if they had never heard of it before, even though they recently worked with the same type of problem! It seems each experience is encapsulated and has no relationship to what has come before or what comes after. Their thinking is what psychologists refer to as an "episodic grasp of reality" (Feuerstein et al., 1980); that is, each event in life is separate and discrete, with no connections to what may have come before or no relation to what follows. Their learning is so encapsulated that they seem unable to draw it forth from one event and apply it in another context. I do not so easily think in words. … After being hard at work having arrived at results that are perfectly clear … I have to translate my thoughts in a language that does not run evenly with them. Language refinement plays a critical role in enhancing a person's cognitive maps and ability to think critically, which is the knowledge base for efficacious action. Enriching the complexity and specificity of language simultaneously produces effective thinking. Language and thinking are closely entwined; like either side of a coin, they are inseparable. Fuzzy, vague language is a reflection of fuzzy, vague thinking. Intelligent people strive to communicate accurately in both written and oral form, taking care to use precise language; defining terms; and using correct names, labels, and analogies. They strive to avoid overgeneralizations, deletions, and distortions. Instead, they support their statements with explanations, comparisons, quantification, and evidence. We sometimes hear students and adults using vague and imprecise language. They describe objects or events with words like weird, nice, or OK. They name specific objects using such nondescriptive words as stuff, junk, things, and whatever. They punctuate sentences with meaningless interjections like ya know, er, and uh. They use vague or general nouns and pronouns: "They told me to do it," "Everybody has one," or "Teachers don't understand me." They use nonspecific verbs: "Let's do it." At other times, they use unqualified comparatives: "This soda is better; I like it more" (Shachtman, 1995). The brain is the ultimate reductionist. It reduces the world to its elementary parts: photons of light, molecules of fragrance, sound waves, vibrations of touch—all of which send electrochemical signals to individual brain cells that store information about lines, movements, colors, smells, and other sensory inputs. Intelligent people know that all information gets into the brain through sensory pathways: gustatory, olfactory, tactile, kinesthetic, auditory, and visual. Most linguistic, cultural, and physical learning is derived from the environment by observing or taking it in through the senses. To know a wine it must be drunk; to know a role it must be acted; to know a game it must be played; to know a dance it must be performed; to know a goal it must be envisioned. Those whose sensory pathways are open, alert, and acute absorb more information from the environment than those whose pathways are withered, immune, and oblivious to sensory stimuli. The more regions of the brain that store data about a subject, the more interconnection there is. This redundancy means students will have more opportunities to pull up all those related bits of data from their multiple storage areas in response to a single cue. This cross-referencing of data strengthens the data into something that's learned rather than just memorized (Willis, 2007). We are learning more and more about the impact of the arts and music on improved mental functioning. Forming mental images is important in mathematics and engineering; listening to classical music seems to improve spatial reasoning. Social scientists use scenarios and role playing; scientists build models; engineers use CAD-CAM; mechanics learn through hands-on experimentation; artists explore colors and textures; and musicians combine instrumental and vocal music. Some students, however, go through school and life oblivious to the textures, rhythms, patterns, sounds, and colors around them. Sometimes children are afraid to touch things or get their hands dirty. Some don't want to feel an object that might be slimy or icky. They operate within a narrow range of sensory problem-solving strategies, wanting only to describe it but not illustrate or act it, or to listen but not participate. The future is not some place we are going to but one we are creating. The paths are not to be found, but made, and the activity of making them changes both the maker and the destination. All human beings have the capacity to generate novel, clever, or ingenious products, solutions, and techniques—if that capacity is developed (Sternberg, 2006). Creative human beings try to conceive solutions to problems differently, examining alternative possibilities from many angles. They tend to project themselves into different roles using analogies, starting with a vision and working backward, and imagining they are the object being considered. Creative people take risks and frequently push the boundaries of their perceived limits (Perkins, 1991). They are intrinsically rather than extrinsically motivated, working on the task because of the aesthetic challenge rather than the material rewards. Creative people are open to criticism. They hold up their products for others to judge, and they seek feedback in an ever-increasing effort to refine their technique. They are uneasy with the status quo. They constantly strive for greater fluency, elaboration, novelty, parsimony, simplicity, craftsmanship, perfection, beauty, harmony, and balance. Students, however, often are heard saying "I can't draw," "I was never very good at art," "I can't sing a note," or "I'm not creative." Some people believe creative humans are just born that way and that genes and chromosomes are the determinants of creativity. Describing the 200 best and brightest of USA Today's All USA College Academic Team, Tracey Wong Briggs (1999) states, "They are creative thinkers who have a passion for what they do." Efficacious people have not only an "I can" attitude but also an "I enjoy" feeling. They seek intriguing phenomena. They search for problems to solve for themselves and to submit to others. They delight in making up problems to solve on their own, and they so enjoy the challenge of problem solving that they seek perplexities and puzzles from others. They enjoy figuring things out by themselves, and they continue to learn throughout their lifetimes. One efficacious person is chemist Ahmed H. Zewail, a Nobel Prize winner, who said that he had a passion to understand fundamental processes: "I love molecules. I want to understand why do they do what they do" (Cole, 1999). Some children and adults avoid problems and are turned off to learning. They make such comments as "I was never good at these brain teasers," "Go ask your father; he's the brain in this family," "It's boring," "When am I ever going to use this stuff," "Who cares," "Lighten up, teacher; thinking is hard work," or "I don't do thinking!" Many people never enrolled in another math class or other "hard" academic subject after they weren't required to in high school or college. Many people perceive thinking as hard work, and they recoil from situations that demand too much of it. We want students to be curious, to commune with the world around them, to reflect on the changing formations of a cloud, to feel charmed by the opening of a bud, to sense the logical simplicity of mathematical order. Intelligent people find beauty in a sunset, intrigue in the geometric shapes of a spider web, and exhilaration in the iridescence of a hummingbird's wings. They marvel at the congruity and intricacies in the derivation of a mathematical formula, recognize the orderliness and adroitness of a chemical change, and commune with the serenity of a distant constellation. We want students to feel compelled, enthusiastic, and passionate about learning, inquiring, and mastering (Costa, 2007). There has been a calculated risk in every stage of American development—the pioneers who were not afraid of the wilderness, businessmen who were not afraid of failure, dreamers who were not afraid of action. Risk takers seem to have an almost uncontrollable urge to go beyond established limits. They are uneasy about comfort; they live on the edge of their competence. They seem compelled to place themselves in situations in which they do not know what the outcome will be. They accept confusion, uncertainty, and the higher risks of failure as part of the normal process, and they learn to view setbacks as interesting, challenging, and growth producing. However, responsible risk takers do not behave impulsively. Their risks are educated. They draw on past knowledge, are thoughtful about consequences, and have a well-trained sense of what is appropriate. They know that all risks are not worth taking. Risk takers can be considered in two categories: those who see the risk as a venture and those who see it as adventure. The venture part of risk taking might be described in terms of what a venture capitalist does. When a person is approached to take the risk of investing in a new business, she will look at the markets, see how well organized the ideas are, and study the economic projections. If she finally decides to take the risk, it is a well-considered one. The adventure part of risk taking might be described by the experiences from Project Adventure. In this situation, there is a spontaneity, a willingness to take a chance in the moment. Once again, a person will take the chance only if experiences suggest that the action will not be life threatening or if he believes that group support will protect him from harm (e.g., checking out the dimensions of weight, distance, and strength of a bungee cord before agreeing to the exhilaration of a drop). Ultimately, people learn from such high-risk experiences that they are far more able to take actions than they previously believed. Risk taking becomes educated only through repeated experiences. It often is a cross between intuition, drawing on past knowledge, striving for precision and accuracy, and a sense of meeting new challenges. Bobby Jindal, then executive director of the National Bipartisan Commission on the Future of Medicare, stated, "The only way to succeed is to be brave enough to risk failure" (Briggs, 1999, p. 2A). When people hold back from taking risks, they miss opportunities. Some students seem reluctant to take risks. They hold back from games, new learning, and new friendships because their fear of failure is far greater than their desire for venture or adventure. They are reinforced by the mental voice that says, "If you don't try it, you won't be wrong," or "If you try it and you are wrong, you will look stupid." The other voice that might say, "If you don't try it, you will never know," is trapped by fear and mistrust. These students are more interested in knowing whether their answer is correct or not than in being challenged by the process of finding the answer. They are unable to sustain a process of problem solving and finding the answer over time, and therefore they avoid ambiguous situations. They have a need for certainty rather than an inclination for doubt. We hope that students will learn how to take intellectual as well as physical risks. Students who are capable of being different, going against the grain of common thinking, and thinking of new ideas (testing them with peers and teachers) are more likely to be successful in an age of innovation and uncertainty. You can increase your brain power three to fivefold simply by laughing and having fun before working on a problem. Why we laugh, no one really knows. Laughing is an instinct that can be traced to chimps, and it may reinforce our social status (Hubert, 2007). Humor is a human form of mutual playfulness. Beyond the fact that laughing is enjoyable, it may have medicinal value as well. Laughing, scientists have discovered, has positive effects on physiological functions: blood vessels relax, stress hormones disperse, and the immune system gets a boost, including a drop in the pulse rate. Laughter produces secretion of endorphins and increased oxygen in the blood. Humor has been found to have psychological benefits as well. It liberates creativity and provokes such higher-level thinking skills as anticipating, finding novel relationships, visual imaging, and making analogies. People who engage in the mystery of humor have the ability to perceive situations from an original and often interesting vantage point. They tend to initiate humor more often, to place greater value on having a sense of humor, to appreciate and understand others' humor, and to be verbally playful when interacting with others. Having a whimsical frame of mind, they thrive on finding incongruity; perceiving absurdities, ironies, and satire; finding discontinuities; and being able to laugh at situations and themselves. Some students find humor in all the wrong places—human differences, ineptitude, injurious behavior, vulgarity, violence, and profanity. They employ laughter to humiliate others. They laugh at others yet are unable to laugh at themselves. We want students to acquire the habit of finding humor in a positive sense so they can distinguish between those situations of human frailty and fallibility that require compassion and those that truly are funny (Dyer, 1997). Take care of each other. Share your energies with the group. No one must feel alone, cut off, for that is when you do not make it. Humans are social beings. We congregate in groups, find it therapeutic to be listened to, draw energy from one another, and seek reciprocity. In groups we contribute our time and energy to tasks that we would quickly tire of when working alone. In fact, solitary confinement is one of the cruelest forms of punishment that can be inflicted on an individual. Collaborative humans realize that all of us together are more powerful, intellectually or physically, than any one individual. Probably the foremost disposition in our global society is the heightened ability to think in concert with others, to find ourselves increasingly more interdependent and sensitive to the needs of others. Problem solving has become so complex that no one person can go it alone. No one has access to all the data needed to make critical decisions; no one person can consider as many alternatives as several people. Some students may not have learned to work in groups; they have underdeveloped social skills. They feel isolated, and they prefer solitude. They say things like "Leave me alone—I'll do it by myself," "They just don't like me," or "I want to be alone." Some students seem unable to contribute to group work and are job hogs; conversely, other students let all the others in a group do all the work. Working in groups requires the ability to justify ideas and to test the feasibility of solution strategies on others. It also requires developing a willingness and an openness to accept feedback from a critical friend. Through this interaction, the group and the individual continue to grow. Listening, consensus seeking, giving up an idea to work with someone else's, empathy, compassion, group leadership, knowing how to support group efforts, altruism—all are behaviors indicative of cooperative human beings. In a world that moves at warp speed, there is more to know today than ever before, and the challenge of knowing more and more in every succeeding day, week, month, and year ahead will only continue to expand exponentially. The quest for meaningful knowledge is critical and never ending. Intelligent people are in a continuous learning mode. They are invigorated by the quest of lifelong learning. Their confidence, in combination with their inquisitiveness, allows them to constantly search for new and better ways. People with this Habit of Mind are always striving for improvement, growing, learning, and modifying and improving themselves. They seize problems, situations, tensions, conflicts, and circumstances as valuable opportunities to learn (Bateson, 2004). A great mystery about humans is that many times we confront learning opportunities with fear rather than mystery and wonder. We seem to feel better when we know rather than when we learn. We defend our biases, beliefs, and storehouses of knowledge rather than invite the unknown, the creative, and the inspirational. Being certain and closed gives us comfort, whereas being doubtful and open gives us fear. As G. K. Chesterton so aptly expressed, "There is no such thing on earth as an uninteresting subject; there are only uninterested people." Because of a curriculum employing fragmentation, competition, and reactiveness, students from an early age are trained to believe that deep learning means figuring out the truth rather than developing capabilities for effective and thoughtful action. They have been taught to value certainty rather than doubt, to give answers rather than to inquire, to know which choice is correct rather than to explore alternatives. Unfortunately, some adults are content with what they already believe and know. Their childlike curiosity has died. They exhibit little humility because they believe they are all knowing. They do not seek out or discover the wisdom of others. They do not know how or when to leverage a love of and lust for learning. As a result, they follow a path of little value and minimal opportunity. Our wish is for creative students and people who are eager to learn. This Habit of Mind includes the humility of knowing that we don't know, which is the highest form of thinking we will ever learn. Paradoxically, unless we start off with humility, we will never get anywhere. As the first step, we must already have what eventually will be the crowning glory of all learning: to know—and to admit—that we don't know and to not be afraid to find out. How can I learn from this? What are my resources? How can I draw on my past successes with problems like this? What do I already know about the problem? What resources do I have available or need to generate? How can I approach this problem flexibly? How might I look at the situation in another way? How can I draw upon my repertoire of problem-solving strategies? How can I look at this problem from a fresh perspective (lateral thinking)? How can I illuminate this problem to make it clearer, more precise? Do I need to check out my data sources? How might I break this problem down into its component parts and develop a strategy for understanding and accomplishing each step? What do I know or not know? What questions do I need to ask? What strategies are in my mind now? What am I aware of in terms of my own beliefs, values, and goals with this problem? What feelings or emotions am I aware of that might be blocking or enhancing my progress? How does this problem affect others? How can we solve it together? What can I learn from others that would help me become a better problem solver? Community organizer Saul Alinsky coined a very useful slogan: "Don't just do something … stand there!" Taking a reflective stance in the midst of active problem solving is often difficult. For that reason, each of these Habits of Mind is situational and transitory. There is no such thing as perfect realization of any of them. They are utopian states toward which we constantly aspire. Csikszentmihalyi (1993) states, "Although every human brain is able to generate self-reflective consciousness, not everyone seems to use it equally" (p. 23). Few people, notes Kegan (1994), ever fully reach the stage of cognitive complexity, and rarely before middle age. These Habits of Mind transcend all subject matters commonly taught in school. They are characteristic of peak performers in all places: homes, schools, athletic fields, organizations, the military, governments, churches, or corporations. They are what make marriages successful, learning continual, workplaces productive, and democracies enduring. The goal of education, therefore, should be to support others and ourselves in liberating, developing, and habituating these Habits of Mind more fully. Taken together, they are a force directing us toward increasingly authentic, congruent, and ethical behavior. They are the touchstones of integrity and the tools of disciplined choice making. They are the primary vehicles in the lifelong journey toward integration. They are the "right stuff" that make human beings efficacious. Ames, J. E. (1997). Mastery: Interviews with 30 remarkable people. Portland, OR: Rudra Press. Bateson, M. (2004). Willing to learn: Passages of personal discovery. Hanover, NH: Steerforth Press. Briggs, T. W. (1999, February 25). Passion for what they do keeps alumni on first team. USA Today, pp. 1A–2A. Carnegie, J., & Stynes, J. (2006). Finding heroes: Be inspired by the stories of amazing journeys. East Melbourne, Victoria, Australia: Allen & Unwin. Chiabetta, E. L. A. (1976). Review of Piagetian studies relevant to science instruction at the secondary and college levels. Science Education 60, 253–261. Cole, K. C. (1999, October 13). Nobel prizes go to Caltech chemist, Dutch physicists. Los Angeles Times, pp. 1, 15. Costa, A. (1991). The search for intelligent life. In A. Costa (Ed. ), Developing minds: A resource book for teaching thinking (Rev. ed., Vol. 1, pp. 100–106). Alexandria, VA: ASCD. Costa, A. (2007). Aesthetics: Where thinking begins. In A. Costa (Ed. ), The school as a home for the mind (Ch. 2). Thousand Oaks, CA: Corwin. Covey, S. (1989). The seven habits of highly effective people: Powerful lessons in personal change. New York: Simon & Schuster. Csikszentmihalyi, M. (1993). The evolving self: A psychology for the third millennium. New York: HarperCollins. de Bono, E. (1991). The CoRT thinking program. In A. Costa (Ed. ), Developing minds: Programs for teaching thinking (Rev. ed., Vol. 2, pp. 27–32). Alexandria, VA: ASCD. Duckworth, A. L., & Seligman, M. E. P. (2005). Self-discipline outdoes IQ in predicting academic performance of adolescents. Psychological Science, 16, pp. 939–944. Dyer, J. (1997). Humor as process. In A. Costa & R. Liebmann (Eds. ), Envisioning process as content: Toward a renaissance curriculum (pp. 211–229). Thousand Oaks, CA: Corwin. Ennis, R. (1991). Goals for a critical thinking curriculum. In A. Costa (Ed. ), Developing minds: A resource book for teaching thinking (Rev. ed., Vol. 1, pp. 68–71). Alexandria, VA: ASCD. Feuerstein, R., Rand, Y., Hoffman, M. B., & Miller, R. (1980). Instrumental enrichment: An intervention program for cognitive modifiability. Baltimore, MD: University Park Press. Glatthorn, A., & Baron, J. (1991). The good thinker. In A. Costa (Ed. ), Developing minds: A resource book for teaching thinking (Rev. ed., Vol. 1, pp. 63–67). Alexandria, VA: ASCD. Hubert, C. (2007, August 12). Why we laugh. Sacramento Bee, p. L3. Kegan, R. (1994). In over our heads: The mental complexity of modern life. Cambridge, MA: Harvard University Press. Perkins, D. (1991). What creative thinking is. In A. Costa (Ed. ), Developing minds: A resource book for teaching thinking (Rev. ed., Vol. 1, pp. 85–88). Alexandria, VA: ASCD. Senge, P. M., Roberts, C., Ross, R. B., Smith, B. J., & Kleiner, A. (1994). The fifth discipline fieldbook: Strategies and tools for building a learning organization. New York: Doubleday/Currency. Shachtman, T. (1995). The inarticulate society: Eloquence and culture in America. New York: Simon & Schuster. Sternberg, R. J. (1984). Beyond I.Q. : A triarchic theory of human intelligence. New York: Cambridge University Press. Sternberg, R. J. (2006, February 22). Creativity is a habit. Education Week, pp. 47, 64. Sternberg, R., & Wagner, R. (1982). "Understanding intelligence: What's in it for education?" Paper submitted to the National Commission on Excellence in Education. Strugatch, W. (2004, December 5). Entrepreneurs tell their success stories. New York Times. Waugh, S. (2005). Chase your dreams. An interactive DVD/video program. Canberra: Australian Government Department of Education, Science and Training, and Team Duet. Whimbey, A. (1980, April). Students can learn to be better problem solvers. Educational Leadership, 37(7). Whimbey, A., Whimbey, L. S., & Shaw, L. (1975). Intelligence can be taught. New York: Lawrence Erlbaum. Willis, J. (2007). Research-based strategies to ignite student learning: Insights from a neurologist and classroom teacher. Alexandria, VA: ASCD.